No more iPhone 5 fun? Samsung plans to modify a patent infringement complaint against Apple to include eight LTE patents and potentially the iPhone 5, according to a case management statement unearthed Thursday. The document, submitted late Wednesday, said Samsung will file a motion soon and may include the iPhone 5, after Samsung has had sufficient time to review the device. However, based on what it's seen of the iOS 6 smartphone, Samsung said it anticipates going after the handset. "Based on information currently available, Samsung expects that the iPhone 5 will infringe the asserted Samsung patents-in-suit in the same way as the other accused iPhone models," the filing read. "Samsung plans to file a motion to amend its infringement contentions to address the iPhone 5 as soon as it has had a reasonable opportunity to analyze the device." From its end, Samsung doesn't anticipate any court delays if it proceeds with a new complaint. "Because Samsung believes the accused functionality of the iPhone 5 will be similar to the accused functionality of other accused Apple products, Samsung does not believe that amendment of its infringement contentions should affect the case schedule," the document stated. The iPhone 5, announced Sept. 12, hits stores and the doorsteps of pre-ordering customers Sept. 21. According to FOSS Patents, Samsung could seek a preliminary U.S. injunction against the device once it's submitted a formal complaint. Preliminary injunctions are only allowed in cases where such an injunction could be dissolved or converted into a permanent ban. Such an injunction, even a temporary one, could harm what may be the best selling smartphone to date in terms of availability and revenue. Samsung was dealt a major blow earlier this week when U.S. District judge Lucy Koh, who oversaw a recent lawsuit trial between the two companies, denied a motion to lift a U.S. sales ban on the Galaxy Tab 10.1. Apple did not immediately return a request for comment on Samsung's court filings. For its part, Samsung told TechRadar that though it'd prefer economic competition over litigation, it has been forced to pursue legal action to protect its patents. "We have always preferred to compete in the marketplace with our innovative products, rather than in courtrooms," Samsung told TechRadar. 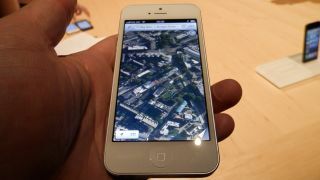 "However, Apple continues to take aggressive legal measures that will limit market competition. Under these circumstances, we have little choice but to take the steps necessary to protect our innovations and intellectual property rights." A hearing is scheduled for Sept. 26 to discuss how this second case is managed.